Pierre Boulez, 1927–2016The death of Pierre Boulez came as a gentle shock to those for whom he is a figure of colossal importance in the postwar musical world. Pierre Boulez: Composer, Conductor, Enigma, the title of Joan Peyser’s 1976 book, does only partial justice to a musician whose contribution was truly much, much more; by times essayist, theoretician, critic, polemicist, builder of institutions, organizer of events, teacher and professor at the Collège de France. that he arrived in Paris from Montbrison in the autumn of 1943 to become a musician; that he studied counterpoint with Honegger’s wife, Andrée Vaurabourg, until 1945; that he was a member of Messiaen’s harmony class in 1944–5, graduating with a first prize in harmony; that he attended classes with René Leibowitz in 1945–6 in which the elder composer conducted detailed analyses of works by the Second Viennese composers; that he broke with Leibowitz in 1946 and, finally, that he worked with the Renaud–Barrault theatre company as musical director betweeen 1946 and 1956. It is the story of a deeply determined young musician who mastered his craft in a surprisingly short time to develop into a composer capable of producing works like his First Sonata for Piano and his Sonatine for flute and piano (1946) when he was still only twenty-one years of age. Of course the story is not quite so straightforward. Schoenberg, Webern, Stravinsky, Debussy and Varèse, while composers of the younger generation such as John Cage and Karlheinz Stockhausen also contributed to his development as a unique creative voice. In a similar way, he was attached to the work of a great number of writers and artists, with the poets René Char, Stéphane Mallarmé and, to a lesser extent, Henri Michaux, as well as the artist Paul Klee, having the greatest importance. An outstanding conductor, Boulez leaves us with multiple box sets of recordings for Columbia, Erato and Deutsche Grammophon, all newly available in this format thanks to his recent ninetieth birthday, but nevertheless affording us the opportunity to gauge the significance of his contribution to the performance traditions of twentieth-century musical modernism. Conducting many of the world’s greatest orchestras and holding principal positions simultaneously with the BBC Symphony Orchestra in London and the New York Philharmonic, as well as conducting some of the great operas of the twentieth century plus Wagner’s Ring at Bayreuth (1976–80), would have been a career in itself for many, but not for Boulez. Viewed less kindly, his great success on the podium has at times been dismissed as either the waste of a great compositional talent or the alibi of a composer who had run out of ideas. Boulez’s friend and mentor Pierre Souvtchinsky noted in a 1963 letter to Stravinsky ‘I’m afraid that anyone who starts conducting like that will soon stop composing.’ Yet, when we consider Boulez’s compositional output in relation to some of the greatest early modernists, Debussy, Webern, Mallarmé, Berg, Joyce, Kafka or Musil, it is clear that the extent of his compositional work easily stands comparison. From the mostly suppressed juvenilia, with its indebtedness to Messiaen and Jolivet, his early compositional development was swift from the rather eclectic Notations for piano (1945), the Schoenberg-inspired Sonatine for flute and piano, and the cellular First Piano Sonata (both 1946). The exploding of classical forms and the atomization of musical material in the Second Piano Sonata (1948) are surpassed by the typically designated zero point of the first book of Structures (1952) for two pianos, the much-cited Structure 1a, in particular, amounting to an algorithm which controls the unfolding of the four parameters of pitch, duration, timbre and attack, albeit following Messiaen’s experimental Mode de valeurs et d’intensités (1949). Viewed latterly by Boulez as more a thought experiment than a composition, it is notable that Pierre Laurent Aimard and Tamara Stefanovich excluded the piece from their complete cycle of Boulez’s piano works at the South Bank in London in 2011. Consequently, it is regrettable that this composition has received more critical attention than any other by the composer, especially by those who wish to dismiss postwar serialism as nothing more than an epiphenomenon of Cold War politics, Richard Taruskin’s recent Oxford History of Western Music being a classic case. Such critics either ignore or are unaware that by 1952 Boulez had already recognized that total organization would lead to ‘deafness’ and would have to be abandoned. Strict, total serialism was in fact a very short moment in the development of serialism, and Boulez’s works from Le Marteau sans maître (1953/55) onwards mark the reintroduction of compositional freedom thwarting submission to systemic requirements. In a period of rapid change, by 1955 Boulez was working on his Third Piano Sonata, an adventurous aleatoric work with five formants or movements, each of which has its own mobile elements and the total form of which was intended to be performable in eight different ways. Ultimately, in the spirit of Mallarmé’s Livre, a great force in the composer’s life, only two formants were ever completed and published, the central Constellation-Miroir (the retrograde version of Constellation), a strong visual corollary to Mallarmé’s poem Un Coup de dés, and the second format Trope (1955–7). 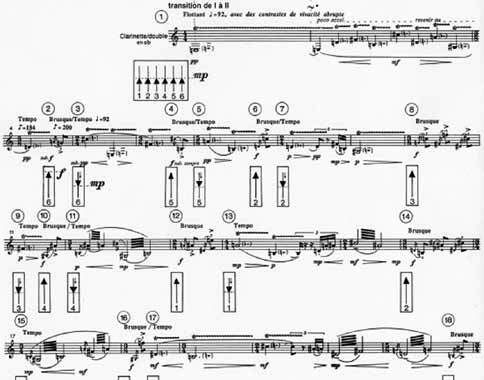 Nevertheless, Boulez followed up with a series of works in which aleatoric elements were included on a number of levels, including Éclat (1965), a kind of aleatoric concerto for conductor. Beyond aleatoricism, Boulez’s output is replete with works that are either incomplete or that exist in more than one version. A great admirer of Joyce, he took to heart the notion of the work-in-progress, routinely spending several years on a single composition. He worked on Pli selon pli, arguably his greatest achievement, from 1957, revising parts of it as late as 1989. Other works such as Le Soleil des eaux and Le Visage nuptial exist in multiple versions, all of which will make for interesting debate as scholars and performers in the future pour over the composer’s choices and compare manifestations. Boulez’s own statement of preference, as canonized in the recent Complete Works box set from Deutsche Grammophon, will surely not be the last word on this. While the pace of composition was never fast, the sketches held in the Boulez archive of the Paul Sacher Foundation in Basel show that composition was never far from mind, and even in the 1960s and 1970s, his supposedly less fruitful years, important works were produced. Already by the late 1950s, Boulez’s position as un official leader of the younger generation of composers was in question with the advance of the dynamic Stockhausen, the aftershock of Cage’s visit to Darmstadt in 1958, the dissolution of the so-called Darmstadt group and the later rejection of serialism by a younger generation in the early 1960s. While he visited Darmstadt several times, Boulez was never a devotee, as is clear from his correspondence, preferring instead either the festival at Donaueschingen or his own Domaine musical concert series in Paris. His break with France was completed with the welldocumented dispute with minister of culture André Malraux in 1966, only for him to return in triumph in 1976–7 to open IRCAM (Institut de Recherche et Coordination Acoustique/Musique) and to become a professor of the Collège de France, holding the latter position until 1995. The opening of IRCAM signalled a decisive new chapter in Boulez’s creative output and resulted in several key works for musicians and live electronics: Répons, Dialogue de l’ombre double, …explosante-fixe… and Anthèmes II. Apart from two early studies for tape, Boulez had never favoured performance with recorded sound alone, but the kinds of technology made available by the alliance of musicians and scientists at IRCAM, supported by generous state funding, enabled him to use electronics within the context of live performance. Like Boulez, IRCAM did not escape fierce criticism, and the institution and its founder were accused of taking a narrow approach, of furthering their own preferences and of an unproductiveness that hardly justified the enormous economic resources in play. Such criticisms have abated in recent years as IRCAM and Boulez’s virtuosic Ensemble Intercontemporain have won over many hearts and minds. Nor did the building of the Bastille Opera and latterly the Phil harmonie concert hall, projects with which he was involved, do his reputation any harm. The events celebrating Boulez’s ninetieth birthday in 2015 provided opportunities for new generations of composers and conductors, such as George Benjamin, Matthias Pintscher and Jörg Widmann, to express their respect, admiration and gratitude for his efforts, and the Lucerne Festival Academy, which Boulez founded in 2003, displayed before the world the esteem he inspired in many young performers and composers. While those who knew him best are agreed that Boulez was essentially a practical man, a doer, he was also a significant musical thinker whose ideas and concepts have become well known outside the musical domain. While he was wary of the complexity of Adorno’s philosophizing, there is no doubting the latter recognized Boulez’s importance. Claude Lévi-Strauss attempted unsuccessfully to discredit his serialism in The Raw and the Cooked. Foucault nominated him to the Collège de France, and Foucault, Barthes and Deleuze participated in a well-known colloqium on musical time in IRCAM in 1978. Deleuze in particular recognized the productive nature of Boulez’s ideas and made terms such as ‘smooth’ and ‘striated’ space, ‘pulsed’ and ‘unpulsed’ time, as well as ‘the diagonal’, part of a shared vocabulary well beyond the narrowly musical sphere. Despite the publication of several collections of Boulez’s essays, lectures and interviews, a great deal of his writings remain untranslated and unavailable in English, principally the greater part of his Collège de France lectures from 1976 to 1995. Beyond the writings, there remains Boulez the correspondent. While English readers have access only to the correspondence with John Cage, his correspondence with ethnologist and musicologist André Schaeffner is the sole collection available in French. Those of us who have had the good fortune to work in the archives of the Paul Sacher Stiftung in Basel, the Bibliothèque National in Paris and elsewhere know the great interest of his unpublished correspondence with Stockhausen, Pousseur, Souvtchinksy, Souris, Stravinksy, Varèse and others. Since his death, it has been reported that Boulez wished to be the first composer without a biography. On another occasion he remarked to Robert Piencikowski that ‘biography is like astronomy. It’s always necessary to have black holes’. With his death, much remains to be done in looking to the musician and to the man, and those of us who had the good fortune to meet him in life and who mourn his passing are grateful for his generosity and the wealth of music and ideas he has left us.